Under Construction! Information here comes from Petco and the web sites listed below. Since Iggy died on 6/24/09, it is not likely that I will ever complete this web page. Curly-tail lizards grow from 4 to 14 inches depending on the species. The jeweled or masked curly-tail lizard, Leiocephalus personatus , grows 4 to 7 inches long according to Petco but 10 inches according to Central Pets. When the curly-tail lizards are hunting, excited, or males showing off, they will twitch or curl their tails over their backs. Curly-tail lizards may live 5 to 7 years or perhaps longer. 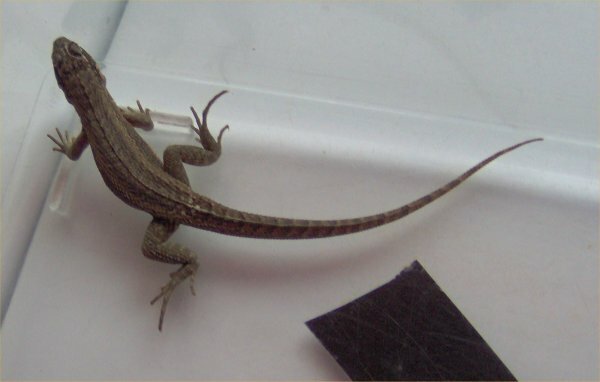 Curly-tail lizards should do well in a 20 gallon long tank when young and perhaps a 40 gallon breeder tank as adults. I found no information aside from the fact that males will fight with eat other and curl their tails. Like most lizards, curly-tail lizards like to have heat sources. They should have an incandescent heat lamp for basking. They need a full spectrum fluorescent light for proper health. During the day, their tank should range from 70 to 95 degrees F (meaning there is one spot that is only 70 some degrees F and one in the 90's for basking). Curly-tail izards are from Cuba, Haiti, and other tropical countries. They like a humidity of 60 to 80% but should also have dry areas in the enclosure. Sorry, I have not had time to fill this in yet. Curly-tail lizards mostly consume small insects and worms such as crickets, mealworms, and waxworms. They may also eat some fruits and vegetables. I will report back later as to what Iggy likes to eat (so far just mealworms but I have only had him for two hours!). As with all reptiles, dust their live foods a few times a week with a vitamin and calcium supplement. Get a free reptile catalog from That Pet Place by calling 1-888-THATPET. Curly-tail lizard - look at that photo! HerpDigest - "A free weekly electronic newsletter on the latest news on reptile and amphibian science and conservation." The Lizard Lounge - a site on lizards. Worm Man - sells live crickets, mealworms, king mealworms, butterworms, etc. Iggy died on 6/24/09 of injuries from escaping and being bit by my cat, Tinkerbelle, on 6/21/09. I miss him so much! Go to the Main Animal Index. See the Master index for the animal pages.